Cambridge, Massachusetts is an incredibly beautiful and diverse city. Just minutes away from Boston, the area is home to incredible culture, history, and some of the most prestigious colleges the United States has to offer. 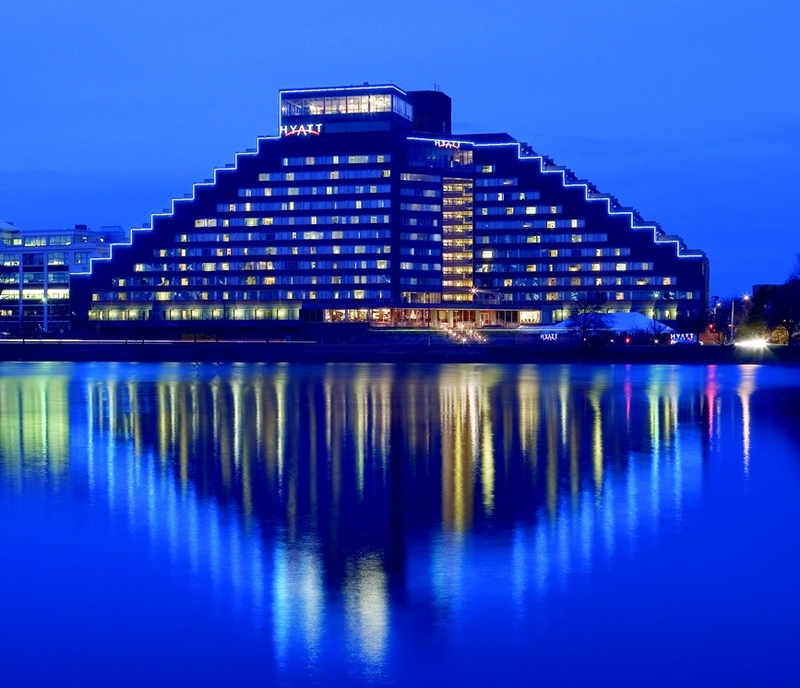 While attending the seventh annual MIT Sustainability Summit on the campus of the Massachusetts Institute of Technology, the Conscious Connection team experienced the luxury of staying in the Hyatt Regency Cambridge. Despite being a fairly large contemporary hotel with modern décor, the Hyatt Regency has an intimate feel. The hotel is located on the picturesque Charles River; rooms overlook either the Boston skyline or the river, where you may see swans relaxing in the gentle current or the Harvard rowing team moving perfectly in sync as they glide down the river. Accommodations worthy of special mention in each room include 37-inch flat-screen televisions, in-room safes, ceramic/ionic hair driers, complementary coffee stations, and ergonomic workstations. Standard Wi-Fi and wired internet for unlimited devices is free; premium service is available for an additional fee. Hyatt grand beds with luxurious linens and plush pillows assure a good night’s sleep; turn-down services and wake-up calls are available upon request. Upgraded rooms with balconies and accessible rooms are available. The hotel will accommodate some pets (no dogs over 50 pounds) for an additional fee. The guestrooms are functional & luxurious for the business traveler & tourist alike. The hotel’s friendly, attentive staff and the Hyatt Has It program will ensure that you have everything you need. They have a wide variety of items you may need to borrow, from flat irons to yoga mats to humidifiers. They also offer an extensive array of complimentary toiletries, including even lint rollers and laundry soap. The hotel offers a 24-hour gym complete with sauna and steam room, and boasts a 75-foot, heated indoor saline pool with adjoining sundeck and retractable roof. Though there is no spa, in-room massages are available (yes, please). Walking, jogging and bicycle paths wind along the river’s edge. Outdoor sports such as sailing, rowing, kayaking, golfing or tennis are all within close proximity. If you have business needs, the hotel offers a 24-hour business center and offers meeting concierge services. The hotel also houses an ATM, a gift shop, and a lending library. The location is convenient to Hynes & BCEC Convention Centers, major universities, hospitals and Logan International Airport. It is only minutes away from minutes from Fenway Park, Boston Garden, The Freedom Trail, theaters, museums and shopping. Beautiful view of the Boston Back Bay Skyline. The hotel can be reached by car, train, or plane. If you arrive by car, the Hyatt has a covered parking garage or valet service, both for an additional fee. Bay Station (Amtrak) is located three miles from the hotel. If you arrive via Logan airport, taxi service can be arranged. If you desire a car during your stay, the hotel will help you arrange for a rental. Regarding your return flight, the hotel also offers Hyatt Fast Board, which allows you to check in for your flight and print your boarding pass in the lobby of the hotel. The hotel offers two complementary 12-passenger shuttles to transport guests from Harvard Square to the CambridgeSide Galleria Mall. For guests who would like to see the city of Boston, the shuttle will stop at Kendall Square MBTA stop (Red Line) or the Boston University MBTA stop (Green Line). The shuttles are available daily from 7:00 AM to 9:00 PM, and operate on demand. Public transportation via MBTA bus is located outside the hotel entrance on Amesbury Street. The MBTA Subway is 1.5 miles from Hyatt Regency Cambridge. Should you want to be more free-wheeling and eco-centric, Hyatt has partnered with Zagster to provide onsite bike rentals. Formal dining in Zephyr on the Charles offers a breathtaking view of the river and the Boston Skyline. In season, lunch and dinner can be enjoyed on the Zephyr Patio. There is also a lounge, a food marketplace, and 19-hour room service. Given Conscious Connection’s passion for sustainability, we cannot imagine staying anywhere else when in the Cambridge area.